Their story is picked up after hostilities ceased and football resumed in 1919, like a lot of sport, the Athenian League that The Kittens had played in before the war had been mothballed during the bloodshed of World War 1. 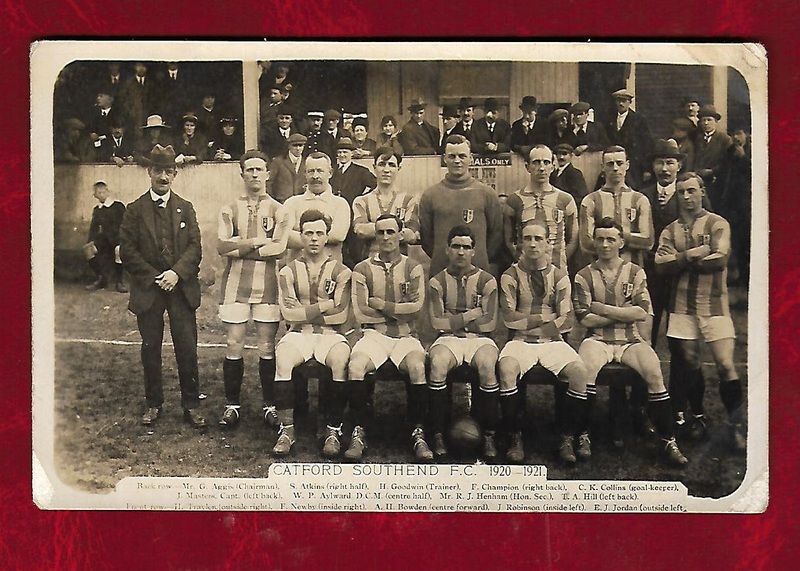 By the time the Athenian League was reformed for the 1919/20 season, Catford Southend had moved on – newcomers to the league that season were to include local non league stalwarts Kingstonian, Bromley and Wimbledon. Catford returned to the London League after the War, it had been their ‘home’ for much of their existence. On the field, the 1919/20 season was a struggle, had it not been for the abject performance of Islington Town, the Kittens would have been propping up the table. Further up the Division, in second place, were Charlton Athletic – the Addicks had initially joined the league during Southend’s brief stint in the Athenian League. It was probably the only time the first teams Charlton and Catford played in the same league – Charlton moved onto the expanded Southern League for the 1920/21 campaign. Catford’s 1920/21 season (team photo above – see notes for credit) ended up with mid-table mediocrity – the brilliantly named Gnome Athletic (later the more prosaic Walthamstow Borough) propping up the table. The following season saw the Kittens finish second, although some distance behind the runaway leaders, Grays. The 1922/23 season, the last in the League saw Catford hovering above the relegation places. Just outside the ground at the Dartmouth Arms on the corner of Laleham and Ringstead Roads. 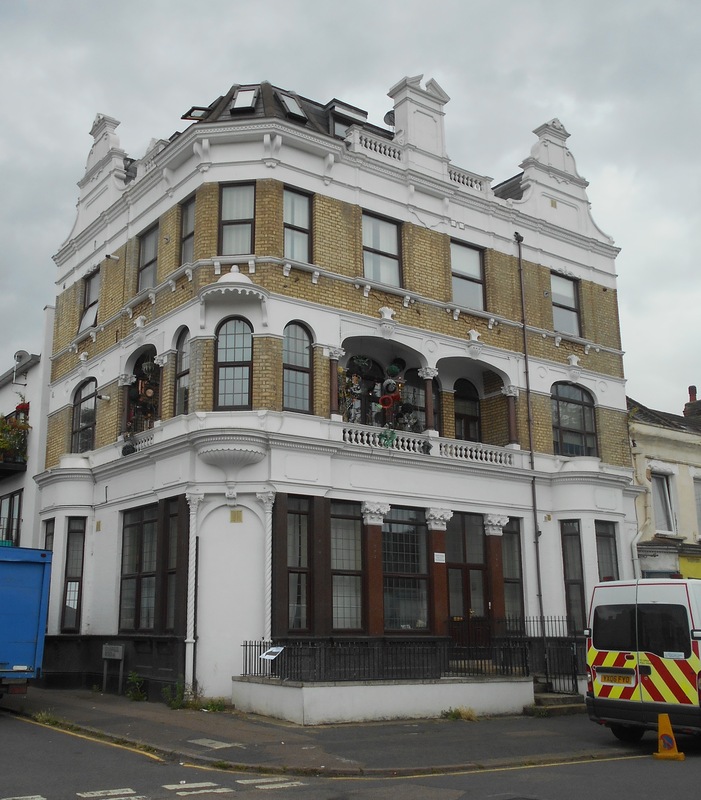 A new landlord, Harry Issaacs, had arrived around 1921who was soon to develop big plans for Catford Southend, it isn’t clear whether he became the owner, but his impact became very clear in early 1923. A proposal was made to Charlton Athletic in April 1923 for them to move to Catford, play at what had become known as The Mount and merge to two teams under the Catford Southend name. The logic for the acceptance had been Charlton’s financial losses in the previous season and the hope that they would get more paying punters in through the turnstiles in Catford. The Kittens had to give up London League status due to potential merger with Charlton as otherwise the merged team would have to play at Catford’s level in the football pyramid. It seems that the orientation of the pitch was changed to allow a larger stand to be dismantled at the Valley and rebuilt at The Mount, Charlton seem to have paid for the move of the stand which would give the ground a capacity of 20-25,000 (other, less plausible, higher estimates are available). The map below (on a Creative Commons from the National Library of Scotland) from a couple of decades later shows the area covered by the enlarged ground. 1923/24 season that saw Charlton ground sharing at The Mount saw Catford playing in the Kent League. As was covered in an earlier post of Charlton’s sojourn at the Mount, attendances were not as expected and at the end of the campaign the Addicks returned to the Valley. Running Past covered Charlton’s short stay a while ago – which included a stand sliding down the created terrace towards Laleham Road. Charlton were heavily criticised at the London League AGM in June 1924 for causing the ‘demise’ of Catford. While the report of club’s death was premature, The Kittens were in a perilous position (1). The 1924/25 season saw the club turn professional in the Kent League, they weren’t allowed back into the London League due to their resignation 18 months before. The decision to turn the Kittens into a professional outfit seemed ambitious at best. There is much less information available about the Kent League, than those seasons that went before, Catford’s story having to be pieced together from very limited local press reports, often little more than scores and few tables. Consequently there are frequent gaps in the narrative. The manager was a former Spurs and Charlton forward Geoffrey Dodd, who had played for the latter at The Mount (2). While there were some the early successes in the Kent League, they were not maintained. The campaign started with a 3-2 home victory over Tunbridge Wells Rangers, with the Kittens coming from 2 down in the final quarter of an hour. The campaign continued well during September with a victory against Bexleyheath and draws against Margate and Gillingham (3). In mid-October there was a trip to Dreamland (above – source eBay July 2017), the new home of Margate; it proved to be a nightmare for the home team – the Kittens mauled the men of Margate 5-3. Unusually, there was a team sheet in the Thanet Advertiser Bransby, Champion, O’Connor, Shaw, Tolhurst, Wells, Hopper, Devonshire, Weston, Humphreys, Mills (4). Results were more mixed during October and November and this became the pattern of things, while it hasn’t been possible to find an end of season table, by the end of March, Catford were mid table – 20 points adrift of the league leaders Chatham (5). The 1925/26 campaign saw little improvement; early poor form saw Catford close to the bottom of the League at the end of October (6). While results improved during December, including a 9-0 home thrashing of Ashford (7) , the mixed results continued, although another 9-0 victory against Sheppey will have brought cheer to the Catford faithful (8). The Kittens were finally allowed back into the London League for the 1926/27 campaign but this seems to have been the final desperate throw of the dice to try to make their professional status work. The Kittens struggled to resource running two teams and started to send ‘short’ teams to some matches – this led to a 13-1 humiliation being inflicted by Sittingbourne (9). They started to not fulfil games in the Kent League, including a no show in Tunbridge Wells in December (10). By the end of January 1927 the Kent League table showed a desperate position Catford had only managed to play 10 games, all of which were defeats, with just 5 goals scored and 49 conceded (11). While the Kent League seem to have been inclined to leniency, once matches in the London League, were failing to be fulfilled, including one at Chelmsford, the London League acted, suspending Catford (12). The Kent League did likewise but seems to have briefly lifted the suspension in an attempt to allow them to fulfil a game at Norfthfleet – which they were unable to do, leading to a further suspension (13). There was to be no comeback this time, by April the record of Catford Southend for the season had been expunged (14). There doesn’t appear to be any evidence of either Isaacs going bankrupt or the winding up of the club, although it may well have been run through a holding company. Ultimately, a successful London amateur non-League team was brought to extinction by over-ambition and trying to take a short-cut to Football League status which some of its nearest neighbours in Millwall, Crystal Palace and Charlton had all already obtained. 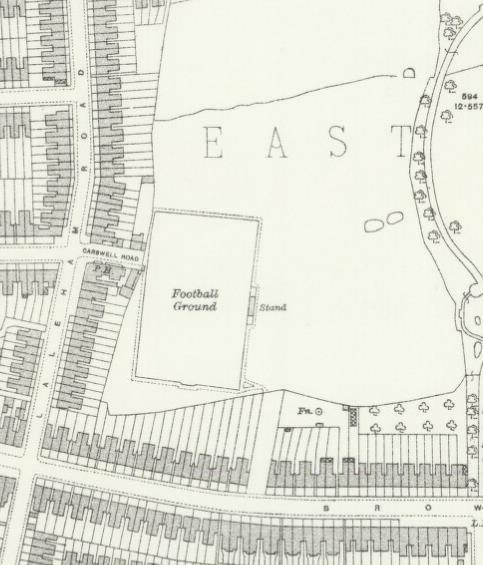 After the departure of The Kittens, the ground was re-absorbed back into the Park – certainly the Ordnance Survey map from 1949 (above) suggests that the stands had already disappeared by then and a new pitch created alongside. The outline of the home of the Kittens is still clearly visible through the large flattened area’ pitch area. Some of the information for the post has come from the fantastic non-League resource Non-League Matters, which, if you have a penchant for league tables past, it could keep you occupied for days. Sadly, the owner of the site looked as though they are planning to mothball the site in May 2017, if anyone reading this has any time on their hands and wants to take it over there are contact details on all the pages on the site other than the home page. 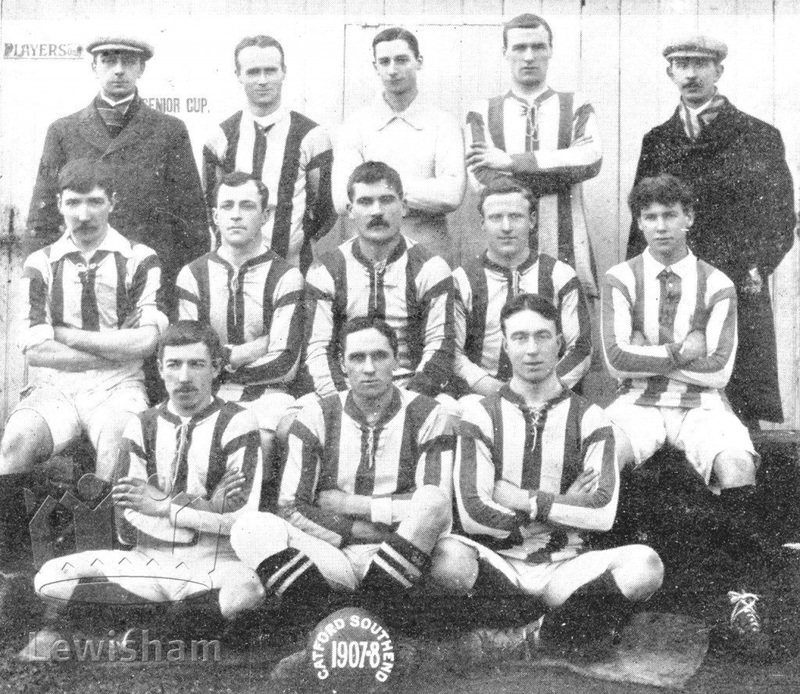 Picture credits – the team photograph is courtesy of the always helpful Lewisham Archives. This entry was posted in Lewisham History, Sporting & Aviation Pioneers and tagged Catford, Catford Southend, Charlton Athletic, Mountsfield Park, The Mount on September 15, 2017 by Paul B.
Catford Southend have been mentioned once or twice in passing in Running Past, notably in relation to their almost takeover of Charlton Athletic and the latter’s brief stay at Southend’s then ground in Mountsfield Park, The Mount. Their story is worth telling in its own right as it became a salutary lesson of what happens when there is over-ambition within football clubs. The club seems to have had its roots in a forerunner club, Catford Rovers, which played from around the 1898/99 season against teams from around Deptford, Lewisham and Greenwich, including Greenwich Pupil Teachers (1). 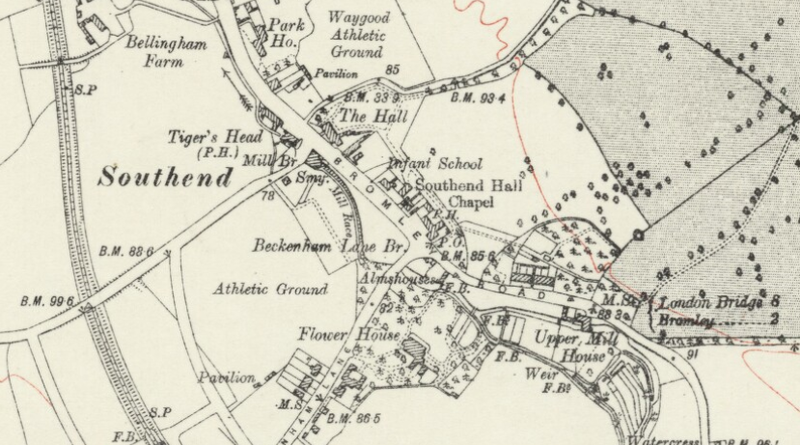 The first reference to Catford Southend was at the beginning of the 1900/01 season with a newspaper report (2) inviting friendly opponents and a trial on playing fields on what is now Canadian Avenue – possibly a rear entrance to what are now St Dunstan’s School playing fields . The secretary lived in a house built a few years before by the Catford builder James Watt. The name Catford Southend suggests a specific location – Southend – around what is currently the junction of Whitefoot Lane and Bromley Road. Press reports for its early years often described their ground as ‘Bromley Road,’ while not absolutely certain this would suggest a ground within the estate of Park House which was at the southern end of what is now Conisborough Crescent. Although it could be the Athletic Ground that is still on Southend Lane and now used by Catford Wanderers. Certainly the former was a location used later as a sportsground by the fantastically named Waygood Athletic (sometimes called Waygood’s) who seem to have played in the long since defunct Southern Suburban League and Dulwich Amateur League along with running cricket teams. They were certainly there in 1914 when the Ordnance Survey visited what was still a largely rural area. (Map image on a creative commons from the National Library of Scotland). The main on-line press references for the Waygood’s are in the years from around 1905 to the outbreak of World War 1. The name was almost certainly a reference to a business name rather than any suggestions of sporting excellence, probably R Waygood and Co Ltd -Manufacturers of lifts, hoists and hydraulic presses who were based in Borough and later merged with Otis. Back to Catford Southend or the ‘Kittens’ as they were affectionately nicknamed, they played in the Bromley & District League 1st Division in their first campaign – the season included home victories against Langdale (3); Bromley St Johns (4); and a 2-1 away victory in Kidbrooke against Anchor, with both goals scored by Boarer (5). By November that season the seeming success meant that they were able to put out a 3rd team which trounced St Laurence 14-1 (6). The Kittens first XI joined the London League for the 1903/04 season, although they kept their team in Bromley League. The London League had been set up in 1896; it was made up of three divisions when Catford joined. The Premier Division was mainly teams that were to become the leading teams of London football – Spurs, Arsenal, QPR, Fulham, Brentford, West Ham and Millwall, who won the League that year. The First Division was in the main the reserve teams of those in the Premier League. The Second Division was a mixture of teams, some still in existence, playing non-League football, others, lost over the years. Catford won the Second Division comfortably – winning all but one of their games. They seem to have had to play games behind closed doors for six weeks after a referee was surrounded and abused by fans (7). By the 1905/06 campaign most of the Premier League clubs had moved on either to the Southern League or the newly extended Football League. Catford entered at the equivalent level, now Division 1, which they again won, ensuring that Chelsea’s reserves came second. The Kittens lost away the away fixture to Chelsea in February 1906 – but won 1-0 at home. The team sheet for the away game still survives. The 1906/07 campaign was less successful finishing only 4th; the following year Catford Southend just lost out on winning the title on goal difference to another lost local club – Deptford Invicta. 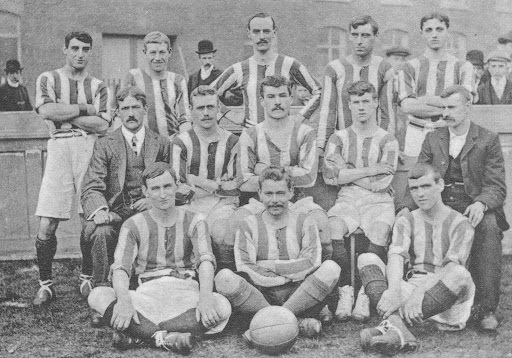 The 1907/08 team (pictured below – see notes for picture credit) nearly saw the Kittens as Champions – losing out to local rivals Deptford Invicta by a single goal’s difference. The next seasons though was were more of a struggle with a relegation battle in 1908/09. 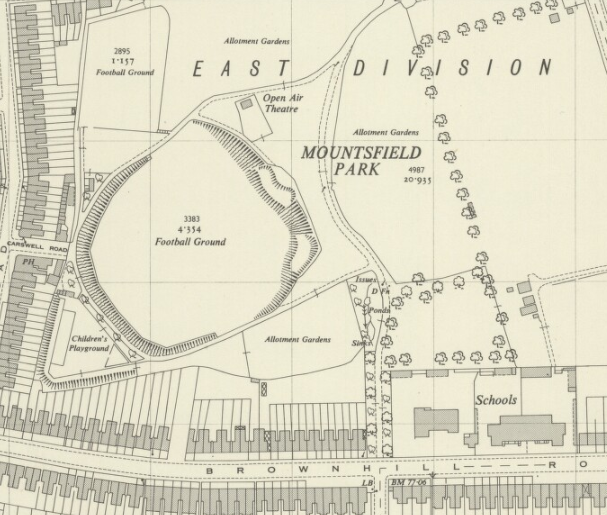 It wasn’t the first time Catford Southend had played in Mountsfield Park, since around 1899 it had been home to Lewisham Montrose (Greenwich Montrose in 1899/1900) who seem to have continued in existence until at least 1907. Lewisham Montrose had an ‘interesting’ pricing policy which allowed the ‘ladies’ of Catford free entry but expected no girls, as the press cutting from September 1904 indicates (10). This would have been about a year before the Park opened to the public after the acquisition of the former home and grounds of Henry Stainton in 1905. 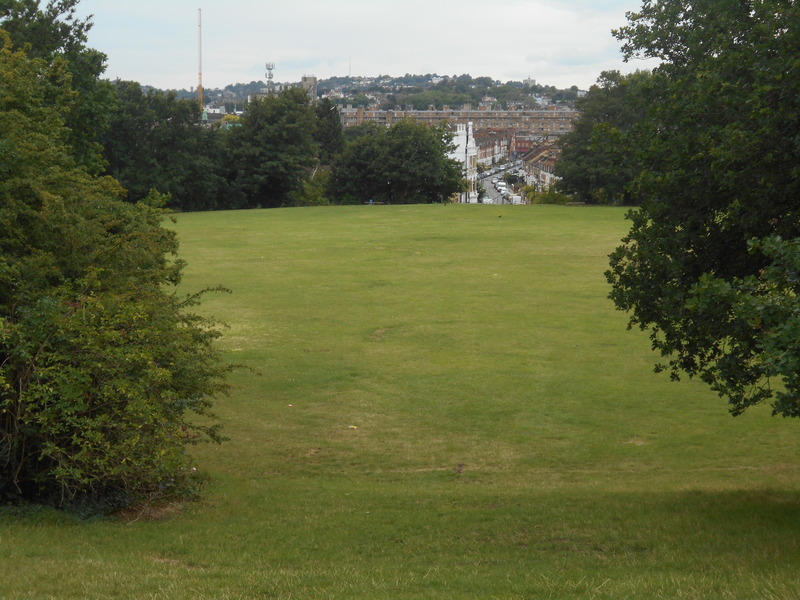 Fortunes in the London League were little better with the move to Mountsfield Park (pictured below), finishing three from bottom in the first campaign there. Rules were changed 1910/11 and allowed promotion to the Premier Division – it was more of a struggle for the amateur outfit playing against professional team’s reserve sides – including Millwall, Clapton Orient and West Ham – the Kittens were 7th from 8, with the bottom team Deptford Invicta. The Kittens only won 4/14 games. The 1911/12 season was little better, but the 1912/13 campaign saw a splitting of the league into two smaller sections, with Catford 3rd from 6 teams. They returned to the London League in 1914/15, finishing 3rd in the Amateur section, but football was curtailed during the war. This is where we will leave Catford Southend, for now, a solid non-League team with a relatively new ground in early 20th century suburbia, in a similar position to many non-League teams that are still around almost 100 years later. Life was to change considerably for the Kittens when hostilities ceased and football resumed in 1919, we will return to their story in a future post. Much of the information for the post has come from the fantastic non-League resource Non-League Matters, which, if you have a penchant for league tables past, could keep you occupied for days. Picture credits – the team photographs are courtesy of the always helpful Lewisham Archives. 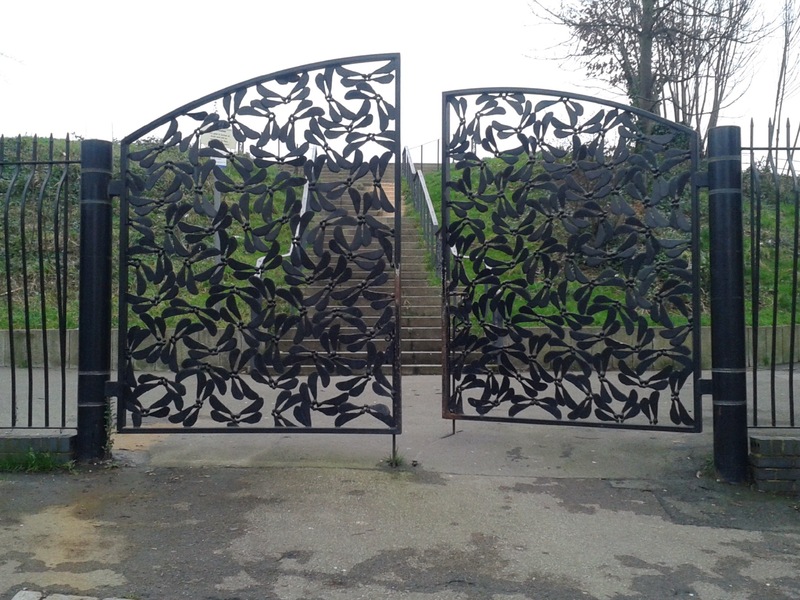 This entry was posted in Lewisham History, Sporting & Aviation Pioneers and tagged Athenian League, Catford Southend, Deptford Invicta, Lewisham Montrose, London League, Mountsfield Park, The Mount, Waygood Athletic on September 7, 2017 by Paul B.
Mountsfield Park in Catford offers some good views across the Ravensbourne valley and, except on People’s Day, is a quiet location. 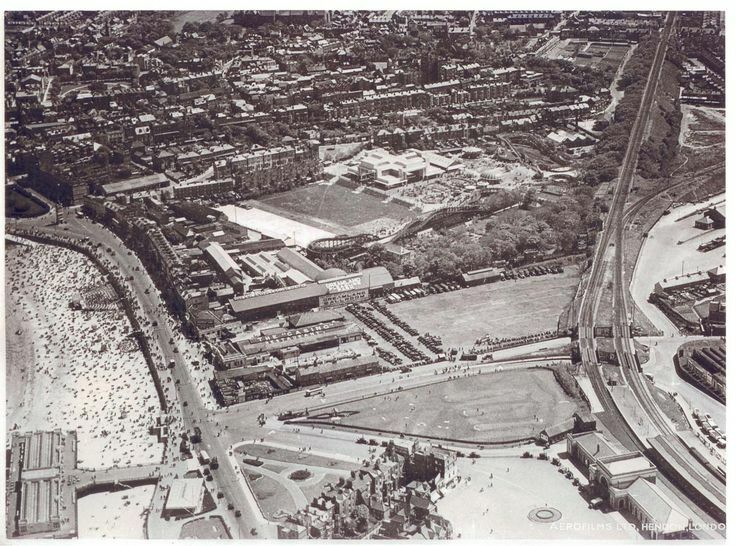 So it is not the most obvious place to expect a 50,000 spectator stadium to be found, but tucked away in the south west corner of it used to be The Mount – home to the Catford Southend and, for a solitary season, Charlton Athletic, who were finding the 75,000 capacity Valley difficult to fill. 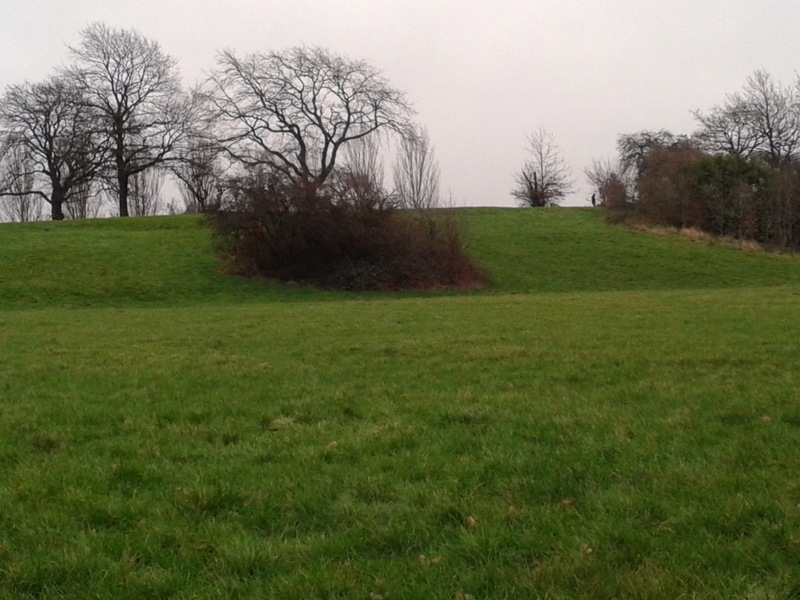 The outline of the ground is clear to see, once you know it is there; a levelled playing area with a bank at one end carved out of the hill and the climb up to the pitch level at the Laleham Road end. 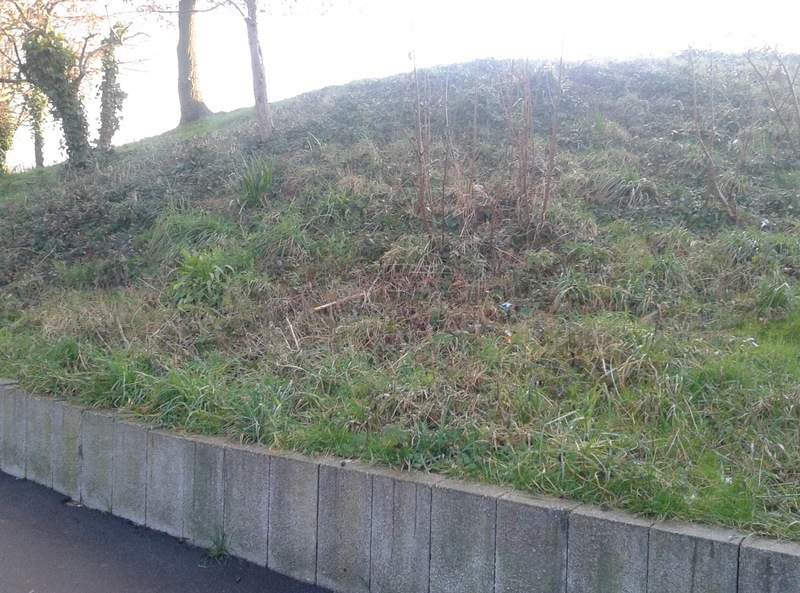 This steep slope up to the pitch proved to be the ground’s almost literal downfall; the Laleham Road end was presumably just into loose earth and the clays from carving the pitch into the slope. There were concrete pylons supporting the terraces there but the 1923/24 season was rather like the 2013/14 season, phenomenally wet and things began to slide towards Laleham Road. Part of the plan in moving to The Mount was to merge with Catford Southend and Charlton played in the colours of ‘the Kittens‘ – light and dark blue vertical stripes although the League had blocked the merger before the season had even started. Charlton’s campaign that season at kicked off with a 3-1 victory against Aberdare Athletic in the old League Division Three, South, but it was still at The Valley as The Mount was not ready until the 0-0 draw with Northampton on 22 December. The season as a whole brought only moderate success on the field – there was a home defeat to Millwall, although a Boxing Day victory over QPR – against whom they had lost on Christmas Day at Loftus Road. Attendances dropped off badly during the season such that by the end of the season, Charlton’s third team, who were still based at The Valley, were drawing bigger crowds than the first team in Catford leading to heavy financial losses. The season and the brief sojourn at The Mount was signed off with a 1-2 defeat to Bournemouth & Boscombe Athletic and 14th position in the league. As for Catford Southend, playing in the Kent League, they continued until 1926/27 when they failed to meet their financial obligations and were initially suspended from the League before being wound up later that season. There are two posts of Catford Southend – split between the years before Charlton and their rapid demise after Charlton returned to the Valley. 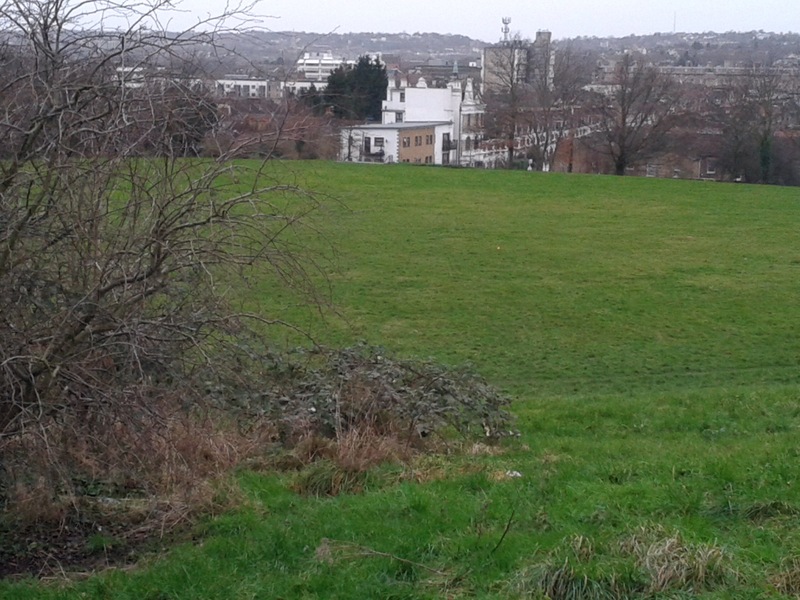 This entry was posted in Lewisham History, Lost Sports Stadia and tagged Catford, Catford Southend, Charlton Athletic, Mountsfield Park, The Mount on February 6, 2014 by Paul B.